ELYSE MILLER: The Mystery Show. A groovy experiment. The Mystery Show. A groovy experiment. It's a secret. A secret show. A secret show? The Mystery Show! I'll tell you the word. It happens next Friday at Avo's. Join me... if you dare! This is THE show. Hope you can make it. 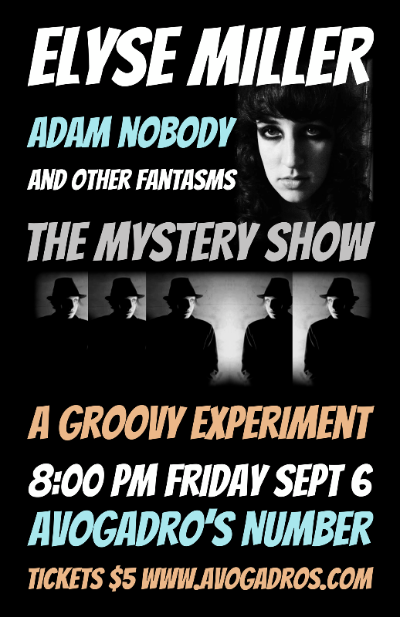 I will be joined by the very talented Mr. Adam Nobody! I'll reveal more of my secret plans this week on KRFC 88.9FM so, keep an eye on Facebook, Twitter, or my website to find out when to tune in for clues!